Megan Petzko-Sweet is a policy advisor for the Michigan House of Representatives Republican Policy Office. Megan advises Republican House members on issues related to Health Policy and the Department of Community Health. 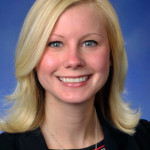 Prior to her work with the House Republicans, Megan was a policy analyst for Blue Cross Blue Shield of Michigan where she focused on issues impacting not only Blue Cross, but Accident Fund and LifeSecure. Megan is a graduate of Thomas M. Cooley Law School and holds a bachelor’s degree in political science from Western Michigan University.